Environmental Commissioner of Ontario Our Environment. Your Rights. Why do we need to know about future climate patterns? If we want to ensure our communities and economy are resilient, we need to make sure Ontarians have access to quality, reliable climate data. To learn more, read our recently released Climate Data Roundtable report. 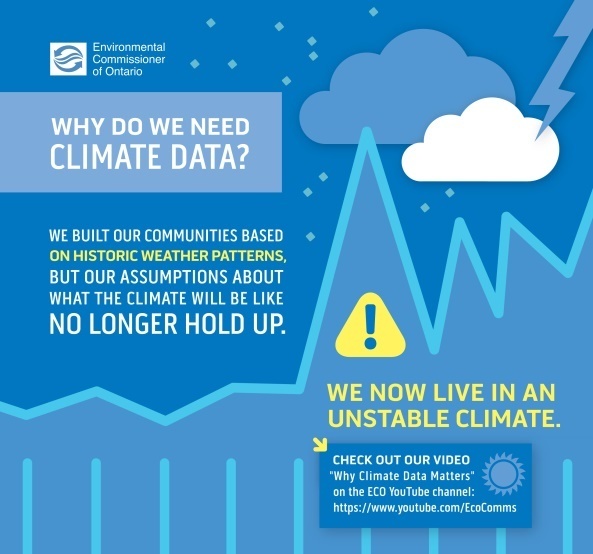 Let this short and simple animation show you why Ontarians need access to reliable future climate projections. Help spread the word and share this video on Facebook and Twitter. Together we can kick-start the conversation on a critical and often overlooked topic. Get email alerts about notices on the Environmental Registry that may interest you — as they are posted. Sign up now! Get all the latest posts sent directly to you. © 2016 Environmental Commissioner of Ontario. All Rights Reserved.